Are the tissues different sizes? They are so cute! Making some for my daughter’s 3rd birthday fiesta! Taking this to class tomorrow and making these with the senior students…then, using them to decorate our principal’s office on her last day before retirement! What a cool way to send someone off in style. She will love it! Aren’t you sweet? Nix my last comment. I got it! Woohoo! Making them for a baby shower. Thanks so much for your awesome tutorials, Peaches. That’s Kiki’s cat, Yentl (you can’t see in this pic, but she looks just like Barbra Streisand). Love it!! We do a big party every year outside and I think this is on my “must do” party decor list! Las flores mas bonitas en todo el mundo!!! I had total faith in you. Ah! Insanely great! I just love your large scale sensibility – and yes, I used to pretend I couldn’t touch the floor, too – except mine was scary water churning with piranhas. Woo-hoo for tissue paper and all it’s craft wonderfulness. Beautiful flowers, good tips! beauteous! happy cinco de mayo to you as well! WOW! Those are ridiculously awesome. Our house looks so happy with party decor, why not leave it up year round? I have a ton of tissue paper from Dollar Tree, and think my kids need some in their room. Thank you! I couldn’t have done it without your insight. Thanks!! I think you have magic in your hands because I am making my fourth flower now and they all look like crap! Ugh. And I consider myself a very crafty person. But your flowers look amazing! These are incredible tissue flowers (and yes, my brother and I had a whole land of lava and other dangers to hop around). Thanks for the trip down memory lane and the pointers for tissue flowers. I’ve always found them to be tricksie. trying this !! and i am putting them around my door like that. i love it. 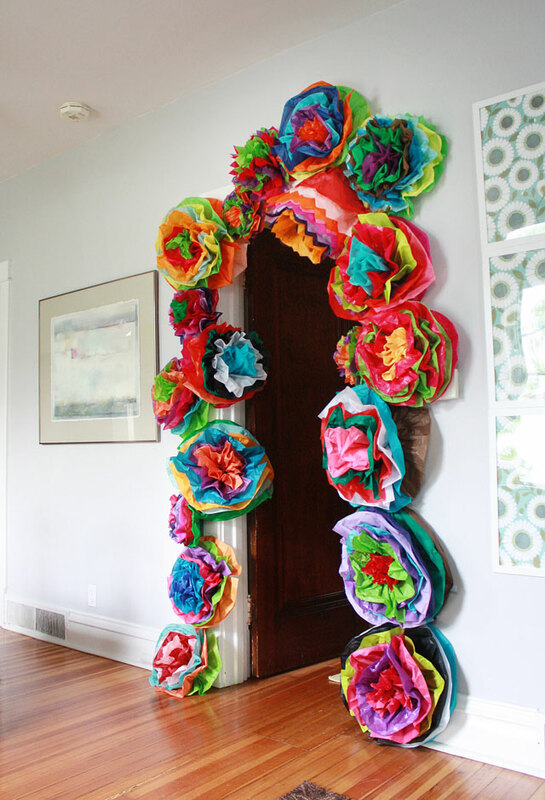 oh shucks i hope this isnt just for cinco de mayo becuase it’s so beautiful i’d love it all year long! what an amazing job you did! glad lemmon jitters introduced me to your beautiful blog! You are the most festive. I think I will make about a bajillion of these tomorrow. How do you make the different sizes? Cut first or after? So cute!!! Me encanta! 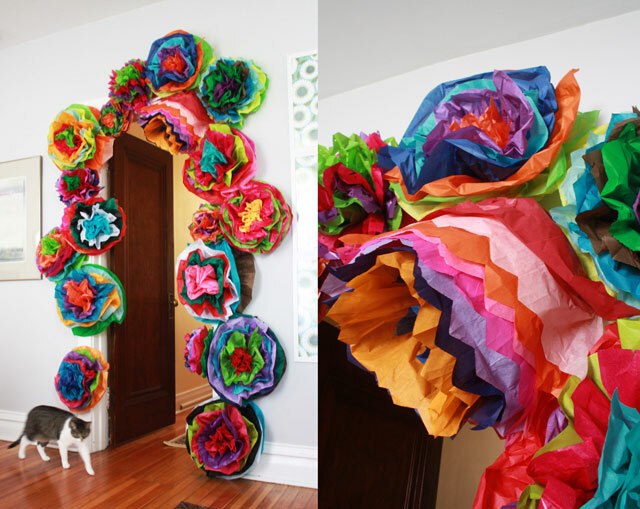 What a fabulous project which can be used for any fiesta, no?!? Thanks for the great post! 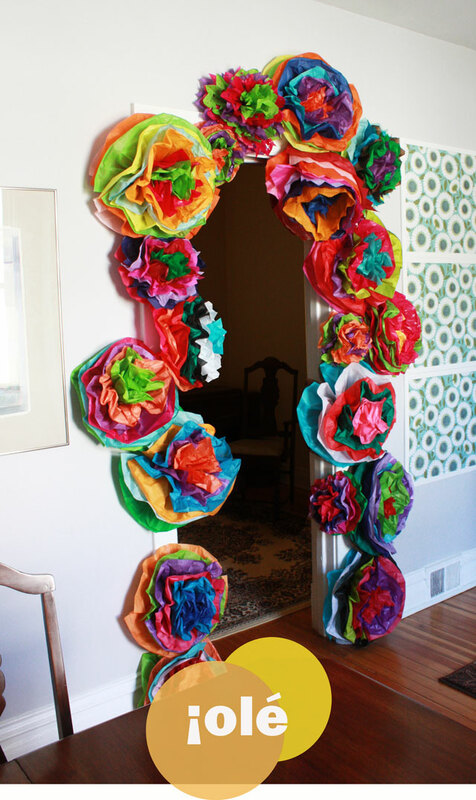 I might just do this for an upcoming graduation party I’m hosting and blogging on this month! Ole! 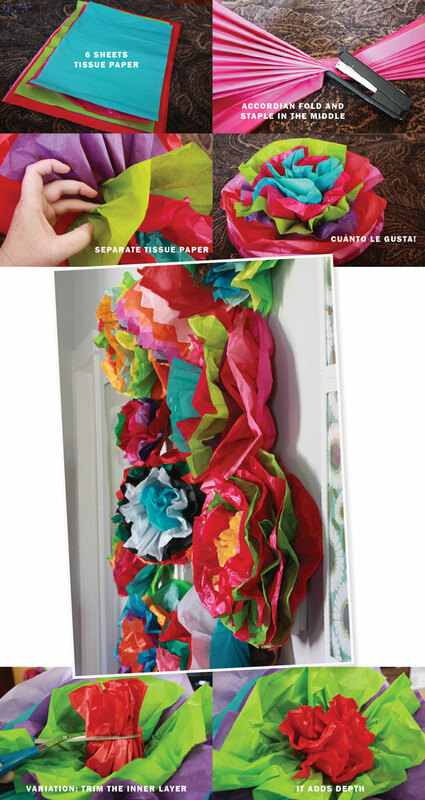 I will be making these for my daughters Graduation/ Birthday Party.. Tissue Paper is amazing isn’t It?? Thank You very much!! How did you get your flowers so round? They look so circular! I can’t figure it out!! so cute!! where did you get tissue that big?? thx! It’s standard size tissue. You’ll have no trouble finding it! Is it all different sizes? Hi there! These are fantastic! How did you stick the flowers on the door? Thank you. Is all the tissue different sizes? It looks different differ size in the pic….but I wanted to ask and make for sure?! ?